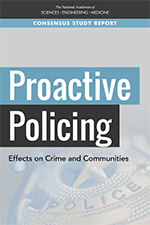 This report from the Committee on Law and Justice finds evidence that a number of proactive policing practices are successful in reducing crime and disorder, at least in the short term, and that most of these strategies do not harm communities’ attitudes towards police. 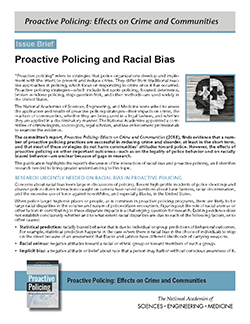 However, the effects of proactive policing on other important outcomes—such as on the legality of police behavior and on racially biased behavior—are unclear because of gaps in the research. Evidence on many proactive strategies is limited to near-term, localized impacts. Little is known about the strategies’ long-term effects on crime or other outcomes, and about whether and to what extent they will offer crime control benefits at a larger jurisdictional level—for example, across an entire precinct or city. Research is needed to understand those impacts as well. The webinar briefing featured members of the study committee that authored the report who discussed the report’s conclusions and recommendations. 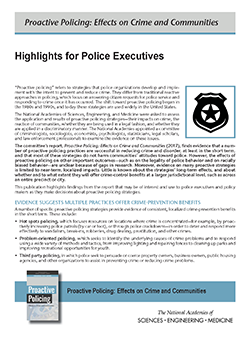 The term "proactive policing" refers to policing strategies that are explicitly intended to prevent or reduce crime, as opposed to reacting to crimes after they have occurred. 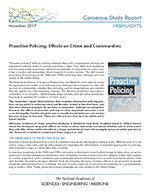 Recently, there has been a growing interest in learning whether these proactive policing strategies are effective on crime prevention, but less attention has been paid to its implications for justice and community relations in the United States.